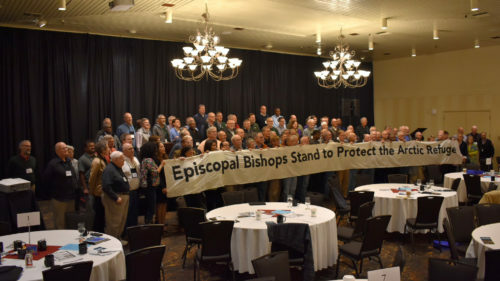 [Episcopal News Service – Fairbanks, Alaska] The bishops of the Episcopal Church are gathered in this small city in the center of Alaska’s northern wilderness for their six-day House of Bishops meeting and to immerse themselves in local examples of creation care and racial reconciliation. There’s no better place than Alaska to discuss themes of environmental and racial justice, Diocese of Alaska Bishop Mark Lattime told Episcopal News Service on Sept. 21 at the midpoint of the meeting’s first day. 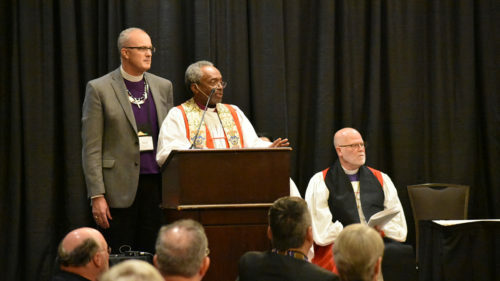 Two Native elders, Will Mayo and Steve Ginnis, joined Presiding Bishop Michael Curry in welcoming bishops as they kicked off the first morning at Westmark Fairbanks Hotel and Convention Center. Mayo is a past president of the Tanana Chiefs Conference. Ginnis is the executive director of the Fairbanks Native Association. The meeting will feature discussions of how Alaska’s changing culture is having an impact on the environment and on indigenous peoples’ ways of life, and the bishops will travel over the weekend to visit villages and congregations to hear their stories firsthand. “Being here in Alaska and listening to and learning from the people of Alaska … helps the word become flesh for us,” Curry told ENS on Sept. 22 after presentations on Native Alaskan culture and natural resources like the Arctic National Wildlife Refuge. As the bishops take in as much Alaska experience as they can from Sept. 21 to 26, the sheer scale of the state can be daunting. Alaska, at two and a half times the size of Texas, makes up a sixth of the United States’ geographic mass. At the same time, it has fewer than 1 million residents, half of whom live in just one city, Anchorage. Most of the state, then, is a mix of relatively untouched wilderness and tiny Native villages that have struggled to maintain their traditions of living off the land. The daunting task of ministering to Episcopalians across such an immense diocese was driven home on the House of Bishops’ first day with a showing of a film produced by the Episcopal Church about Bishop William Gordon, who led the Diocese of Alaska from 1948 to 1974. 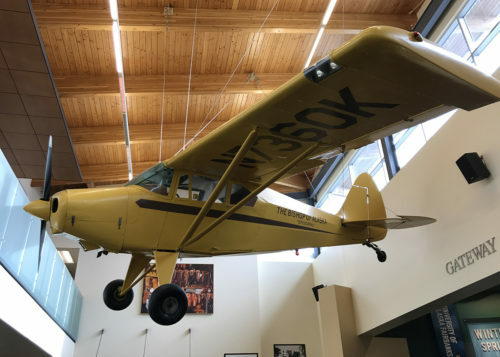 Gordon learned to fly so he could pilot his small plane across the state to visit congregations, earning him the nickname the “flying bishop.” The bishops viewed the film about Gordon at the Morris Thompson Cultural and Visitors Center, where Gordon’s plane hangs near the entrance. This is the first House of Bishops meeting hosted by the Diocese of Alaska, Lattime said. About 115 bishops are attending, some accompanied by spouses. Former Presiding Bishop Katharine Jefferts Schori, Curry’s predecessor, is joining them in Fairbanks in her new role as assisting bishop in the Diocese of San Diego. 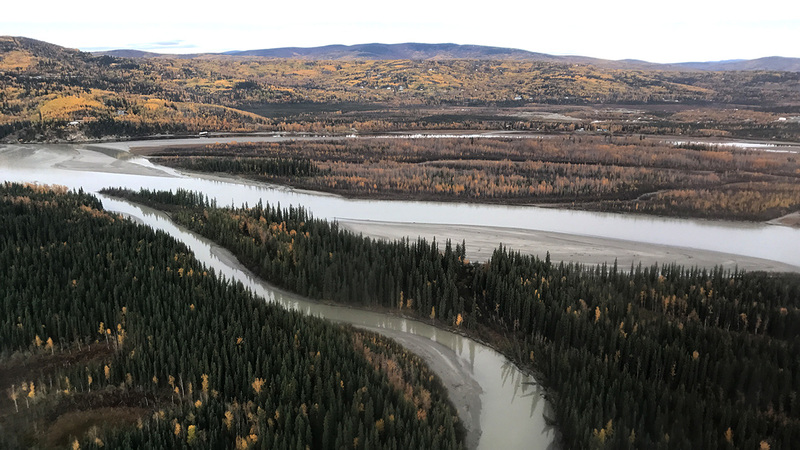 On Sept. 23, small groups of bishops and spouses will split up and fan out to the north to visit the villages of Allakaket, Beaver, Eagle, Fort Yukon, Huslia, Tanana, Venetie and Arctic Village. Arctic Village is on the southern edge of the far northern Arctic National Wildlife Refuge. Protecting the federal refuge from oil drilling has been a priority of both conservationists and indigenous rights activists in Alaska. The Episcopal Church has joined in that activism. Then on Sept. 24, the bishops will split into three groups, this time traveling to three different Episcopal churches in the Fairbanks area to attend Sunday worship services. The bishops will reconvene as one group that night for a potlatch at St. Mark’s Episcopal Church in Nenana. A potlatch is a native Alaskan ceremonial meal and event that typically features traditional food, drumming and dancing. The House of Bishops meeting concludes Sept. 26 with a business session, Eucharist and closing dinner. Hurricanes in the Caribbean and on the Gulf Coast of the U.S. have dampened turnout slightly, with three Texas bishops and two Florida bishops remaining in their storm-ravaged dioceses after Hurricane Harvey and Hurricane Irma. In addition, Bishop Rafael Morales of Puerto Rico canceled plans to attend the meeting after Hurricane Maria struck, knocking out power everywhere on the island. Bishop Julio Holguin of the Dominican Republic also was expected to skip the meeting. During Eucharist on Sept. 21, Curry offered prayers for the people in those dioceses, as well as the victims of a major earthquake that struck Mexico this week. The bishops also took a moment at the service to welcome the Rt. Rev. Todd Ousley as the new bishop for the Episcopal Church’s Office of Pastoral Development. Ousley delivered the service’s sermon, calling the bishops “fellow tax collectors and sinners” like the ones Jesus invited to his table. An excellent meeting location! It will definitely help do good things. I am so proud of our bishops! Thank you for the full page NY Times statement. So very well said. If the Bishops are so worried about the environment, why did they fly hundreds of people to a remote location burning tons of jet fuel and adding to their carbon footprint? Skype would be more environmentally friendly. Just a piece of ancient history… I think that airplane was named The Blue Box after the ECW United Thank Offering “blue box ” because those saved quarters and dimes, etc., by Episcopal women across the country are what funded the first plane of the bishop of Alaska. I am glad the Bishops meet face to face for abrazo a abrazo..there is nothing better than REAL LIFE/LIVE person-to-person relationships to understand one another, stimulate thinking, add more joy for simply “being” and also to fire-up enthusiasm for needs to be met and even sometime miracles to be revealed and performed. The gifts of “gifted” human interaction are many, let’s encourage comradery, share more “native” recipes and love one another, more, more, more. Prayers ascending for Puerto Rico and the Virgin Islands.